Such people are generally tall and lanky. The hair is prone to dryness and may become brittle. They speak hurriedly and their movements are swift. They have rough, dry skin. Restless and anxious by nature.Prone to fear and panic attacks. They have trouble sleeping and some of them suffer from Insomnia. The eyes have a reddish hue. While most people worry about losing weight, a vata person is either underweight or slightly on the thin side. The health problems that these people are prone to include anxiety, pain, sciatica, headaches, osteoarthritis, dysmenorrhea, palpitation, dry cough, nervous disorders etc. Food to avoid-dry, stale, alcohol, black tea, black coffee, cigarettes, barley, fermented food items ,eggplant, dried beans etc. Food to eat- Avoid stale, processed and cold food items. Sesame oil, coconut, curd, cinnamon, nutmeg ,mung, carrots, apricots etc. 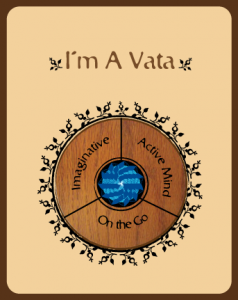 are vata pacifying. Meditate regularly to ward off stress. Regular exercise will help alleviate pain.